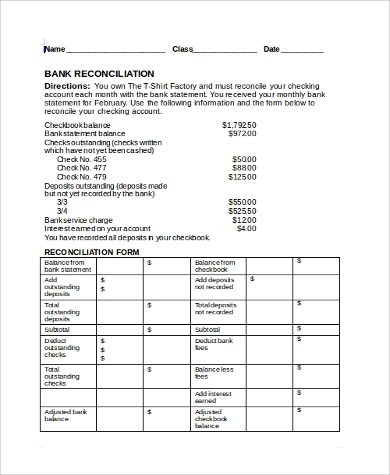 A reconciliation statement records the difference between any two bank accounts to find out the reconciling amount. It is used by banks and companies. It begins with the company’s records of the account balance, then includes or deducts the amount of reconciling items and ultimately arrives at the account balance of the other party. A bank reconciliation form records these transactions for a particular account number. The reconciliation amount is arrived at by making adjustments. Listed below are a few sample forms for your reference. You may also see the Sample Forms to get a proper insight about the format of such forms. 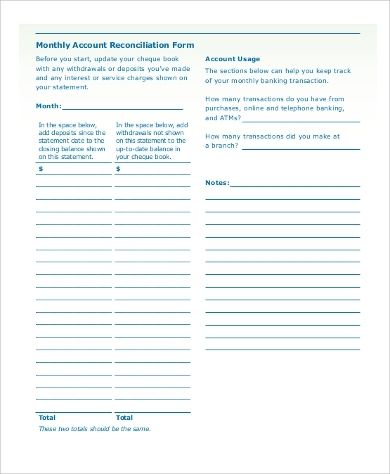 A reconciliation worksheet arrives at the ending balance of any account by two ways. It records the outstanding checks, total adjustments, interests, transit deposits, and bank charges. The end section consists of the details about the reviewer of the Reconciliation Worksheet Sample. 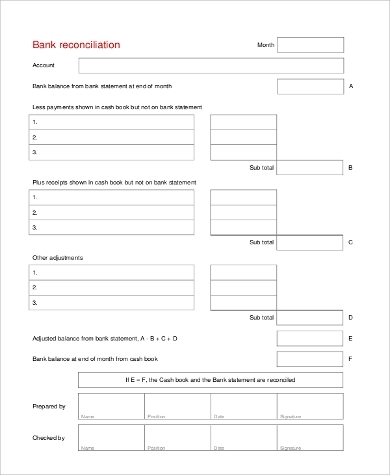 Bank reconciliation forms are also available for monthly records. This form records the total amount of outstanding checks and deposits in tabular columns. It also maintains the record of trust ledger liability between the buyer and the seller. Blank bank reconciliation form records the cash book and bank statement summary for the account. It has three columns for add, less, and equal for recording the different amounts. The total adjusted bank balance is written in the end. What are the uses of this form? 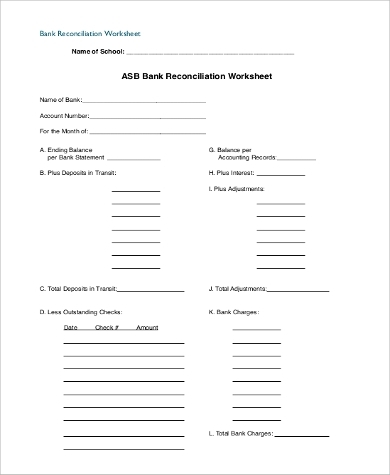 A Bank Reconciliation form records the deposits and checks for calculating the reconciling amount between the bank and the company’s account statements. It compares your book balance and the bank’s version of it known as the bank balance. This form is useful for arriving at this difference known as the reconciling amount. It is useful for the company in detecting any faults in the bank account transactions. This form is useful for big audits for corporate companies and also for singular accounts owned by individuals. 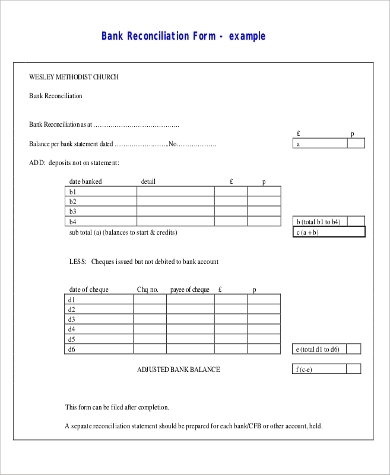 Bank reconciliation examples are helpful in filling this form in the correct format. 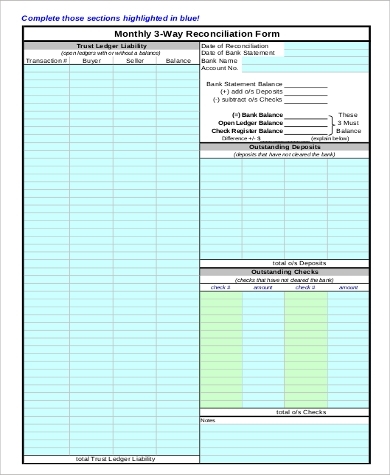 These forms are used for daily, monthly, or annual reconciliation records. 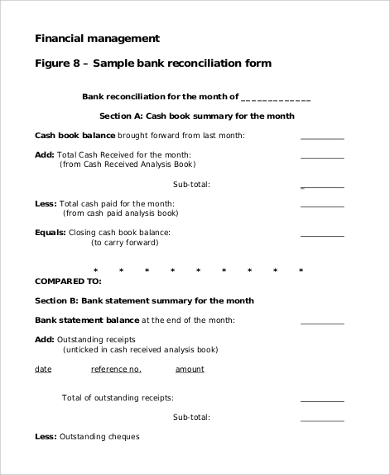 For recording the total bank reconciliation amount, there are Bank Reconciliation Examples. It records the balance for the checkbook and the bank statement in tabular columns. This form records all the statements outstanding statements and deposits. The bank reconciliation statement is recorded through fewer payments and plus receipts in the form. It adds all the adjustments and calculates the adjusted Bank Statement at the end of the month. This form also contains information about the people who have prepared and checked the form. What are the benefits of this form? Bank reconciliation is an important process for the financial structure of all kinds of business companies. 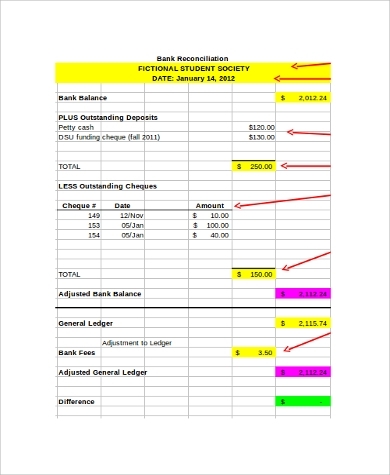 A bank reconciliation form is beneficial in this accounting process. It helps in calculating the difference between the company’s balance amount and the bank’s amount. It records all the checks, deposits, and adjustments. This form is beneficial for detecting frauds and errors made by the company or bank personnel. This form includes a careful check of the bank and company financial records and hence, finds all the faults. It also helps in preventing overdrafts by mentioning a complete record of all the financial statements between the buyer and the seller. Bank reconciliation examples benefit the companies by improving their accounting structure. 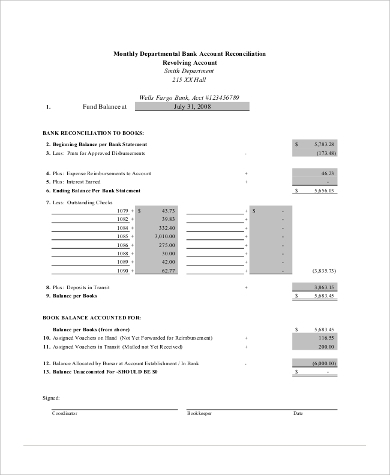 A bank reconciliation form is required to review the Financial Statements of the bank and the company or an individual to calculate the reconciling amount. You can refer to sample bank statements and checkbook balances to fill this form correctly. It is beneficial for detecting the minute errors and also helps in preventing overdrafts.